Whether you choose to screen your target against our comprehensive libraries of small molecules, have your own compound library or prefer an independent library, the SAMDI Tech team has you covered. We do all the work, making screening your targets better, faster, label-free and as easy as ever. Plus, when you use our compound libraries, you can leave intellectual property (IP) worries behind. Any compounds identified as hits from our libraries are yours to pursue. 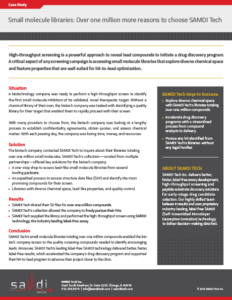 Learn how SAMDI Tech’s small molecule libraries enabled a biotech company access to the quality screening compounds needed to identify encouraging leads.